The subject of cutting boards can be as varied as the boards on the market now days. Most of them are made of plastic or wood or bamboo. I have several of each and have tossed some that I did not like at all, among them some bamboo I let myself spend too much money on. I prefer wood, which if you take care of it can last a lifetime of cooking. I have a nice large wooden bread board that I don’t cut on too often as I use it to roll out pie crust and cookies. I do have some smaller wooden ones that I cut on. Sue has our Grandmother's bread board that she cut bread on and uses it for that. I like to buy boards that I can hang up as they take up no shelf space that way. I also have plastic ranging from small to large. My problem with them is that they gouge from the knives and than stain and I think they dull the knives. For a few years I could buy Saran brand disposable cutting boards and despite the cost I used them especially for poultry. Roll up and throw away the mess and no contamination. If they were still available I would purchase them now. Sue shared some photos of hers, including the Danesco pastry mat which she says she likes because she can cut on it without hurting it, unlike the silicone mats, and John’s favorite cutting boards the one with the lettuce is 11.5x9 and the onion board is 6x8. They are Epicurean brand and he really likes them. She also has the reversible over-the-counter pastry/bread board that she uses all the time. She added a stick-on tape measure to the top lip on the plain side so she can measure the length of bread strips and the like. She never uses her bread boards for anything but bread and pastry. Which ever kind you buy, do take care of them and and if they are plastic and you use them for meat and poultry, scrub well or run through a hot soapy dishwasher cycle to remove the germs. It really is good to have separate ones for meat and chicken; don’t use them to cut vegetables on unless you have throughly cleaned them. Well since you posted about cutting boards, I'll share my public blog link with you. If you scroll past the 1st post of a mosaic....you'll see the cutting boards my husband makes. He just started this as a hobby. And, now people are asking for them. Beautiful! My son made a smaller one out of strips of maple and walnut for me...very precious, and one I use. Very nice boards, but I have counter envy, what a unique and beautiful counter. JR, your husband's cutting boards are gorgeous! And your mosaics are stunning! Both of you are mega-talented! I really love your diving helmet and octopus. 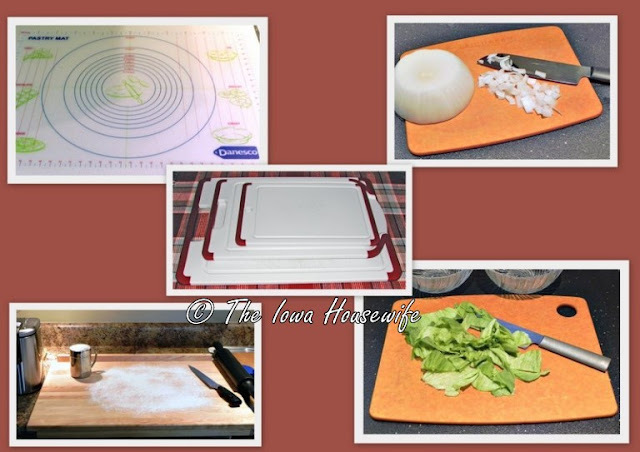 Focus: I have 10 plastic, dishwasher-safe cutting boards of different sizes. I have a few "nice" wooden ones strictly for cheese trays. I don't think that plastic dulls knives more than wood, but glass is surely the worst. My mother uses glass cutting boards (because they hand-wash well) and her knives barely cut butter! Colleen, what a fun thing to collect. There are a lot of different unique cutting boards out there. I use the red rimmed plastic boards in your picture.....I have 5 various sizes and I love them all...They are rimmed to collect any food run-off when chopping, they stay firm in place on the counter, and I just throw them in the dishwasher after each use...They come out completely stain free and like new. Great post and very informative and helpful...Thanks.